Cross-posted from my colleague Jackie Whiting's blog, Beyond the Stacks. We co-taught the lesson, but Jackie wrote this. Students frequently ask: can you help me find a source that's not biased? When they ask that question we know what they mean, what it shows us the students need to learn is that 1) there are degrees of bias and 2) everyone has bias, so 3) there is no such thing as unbiased. Instead, we need to teach students to recognize what a text creator's bias is and how or whether that bias negates the usefulness of that source for the student's purpose. Today we worked with a class of grade 11 students doing research for an in-depth research paper. The focus of the class unit is on the relationship between socioeconomic status and educational experience so this topic will frame the research questions the students are seeking to answer. 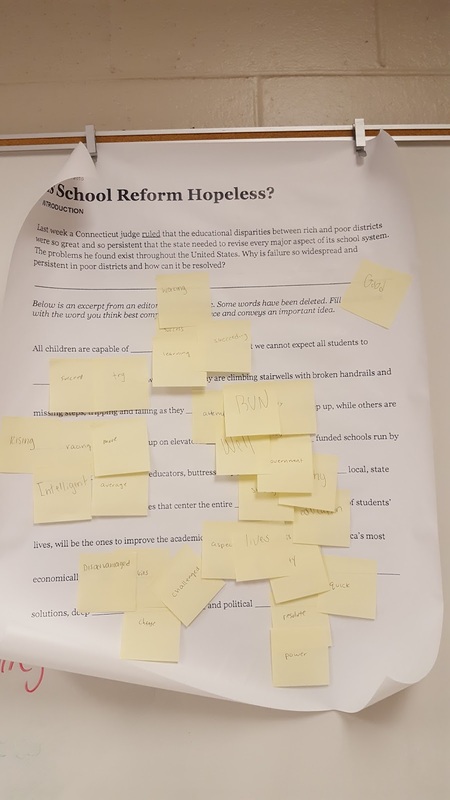 To facilitate the students' resource selection and understanding of the impact of bias on source credibility we worked with the class unpacking an editorial from the "Room for Debate" section of the New York Times in response to the question: "Is School Reform Hopeless?" We scaffolded this exercise to help students begin to understand their own biases on this topic and how their bias will influence how they understand what they read and how they convey what they ultimately write. We selected one of the editorials and provided the students just the conclusion to that text. We selectively removed words from the paragraph and asked students to replace the blanks with whatever word they each thought would best convey the meaning of the paragraph. 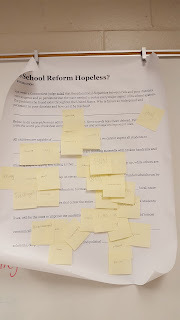 When they completed this exercise individually, we asked them to work with 2 or 3 other students in the class to compile their words on one document and compare how they each completed the paragraph and how their choice of words changed the meaning of the paragraph. 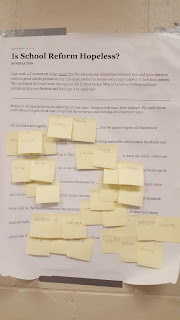 The pictures below are of the excerpted paragraph with the students' words on post-it notes. The students were able to see that racing implies competition, rising implies progress and maybe increase in status, while moving is more passive. They were surprised that none of those were the words that the author used but they couldn't think of another word to use. The actual sentence is: "...too many are climbing stairwells with broken handrails and missing steps, tripping and falling as they work to keep up, while others are zooming up on elevators..."
Certainly working implies a conscious sense of purpose and purposefulness to the effort that is not reflected in struggle, try or attempt. Work may also imply a degree of success and ability absent in those other terms. Zooming also has a very different connotation than the words the students chose, particularly in contrast to working. So, we asked students to compare their bias with that of the author and consider how differing opinions might influence their assessment of the source's credibility. 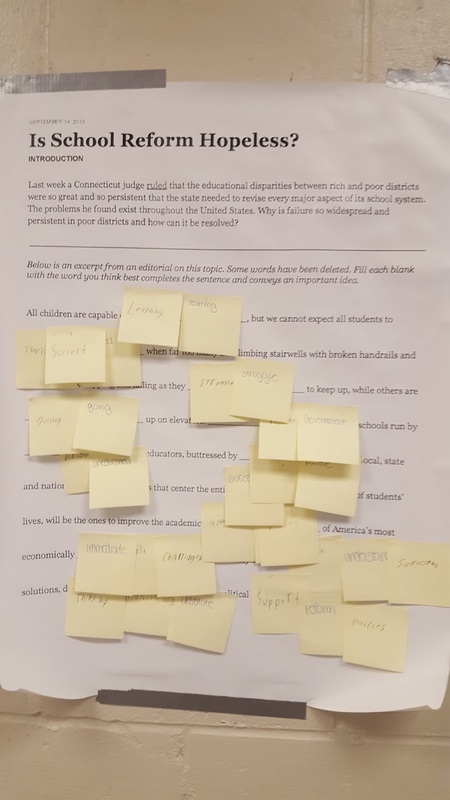 For the next phase of this exercise, we provided the students with the rest of the editorial where we had highlighted words or phrases and added questions to invite students to discuss the writer's choice of word and how those words affected the meaning of her editorial. "In addition to attending to these basic survival needs, schools have to attract experienced teachers and leaders with the right sensibilities and training to educate youth from diverse social and cultural backgrounds. Successful school districts also enhance youth development through extracurricular activities and additional enrichment. When families cannot afford costly after-school programs, personal tutors and experiential summer vacations, effective school-communities invest in programs to offset these opportunity gaps." Click to see how Allsides defines equity and the cartoon they use to distinguish "equity" from "equality". We think this resource is incredibly valuable to students as they learn to navigate the information they encounter and develop information literacy -- particularly in the face of fake news! Carter, Prudence L. “Poor Schools Need to Encompass More Than Instruction to Succeed.” The Opinion Pages: Room for Debate, New York Times, 14 Sept. 2016, www.nytimes.com/roomfordebate/2016/09/14/is-school-reform-hopeless/poor-schools-need-to-encompass-more-than-instruction-to-succeed. Here you can find even more related articles from advanced successful writers. A very good lesson, and it must be fun to teach as the students use their own words to prove how their meaning can be surprisingly subjective. Hello! For the header of mmogo.com this wonderful post, what font did you use for "fonts" for "headline fonts"? It looks so nice! more advanced articles for users. Better article which gives a good lesson to students.